WESTERN WELL TOOL (WWT) Non-Rotating Protectors (NRP) reduce rotary torque and drag, and provide casing and riser protection during directional, extended reach, sidetracking, and deep-water drilling operations. WWT’s years of experience enable us to create accurate placement recommendations and provide reliable services. 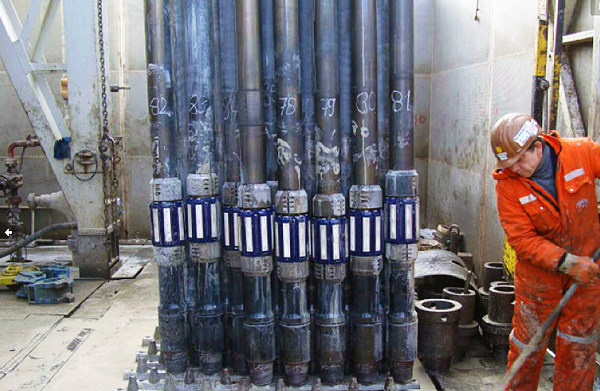 A complete, confidential well analysis is performed before each installation to ensure that optimal performance is achieved based on each well’s unique design and drilling conditions. This analysis is performed free of charge and without obligation. The NRP assembly consists of an aluminum stop collar above and below a reinforced polyurethane sleeve that has an OD greater than the tool joint. The assembly is installed directly above the tool joint and creates a friction-reducing standoff between the tool joint and casing/riser. The NRP sleeve’s patented design creates an effective fluid bearing within its ID. The combination of the tool joint standoff, fluid bearing and WWT placement analysis significantly reduces rotary torque, drag and casing/riser wear.